Did your school district make the list? Access to top-quality public schools is often one of the deciding factors for young families when they’re finding a home. That’s probably why the best school districts tend to attract some of the wealthiest inhabitants, as those are the people most likely to have the resources and flexibility to be able to move into these sought-after neighborhoods. However, depending on where you live, the incomes in the top school districts in your state can vary widely, according to a new analysis from GOBankingRates. GOBankingRates found that some districts appear to offer an opportunity for middle-class Americans while others seem limited to only some of the wealthiest people in the country. The study looked at every school district in the country to determine which ones have the highest household median incomes in each state. The results show an America that’s starkly different from state to state when it comes to income and wealth. A quick look at the states with the wealthiest school districts would indicate that there’s a clear correlation between the states with the highest average incomes and the richest schools. Of the 10 states with the wealthiest school districts, five are also among those states with the highest household incomes — New York, New Jersey, Connecticut, California and Massachusetts. Likewise, there are similar trends when comparing the richest school districts in each state to the median home prices across the country. Once again, five of the 10 states with the wealthiest school districts also appear among the 10 states with the highest home costs — California, Massachusetts, Washington, Oregon and New Jersey. However, some states — including Hawaii and Alabama — bucked these trends. Despite being the state with the fifth-lowest average household income and the sixth-lowest median home price, Alabama comes in at No. 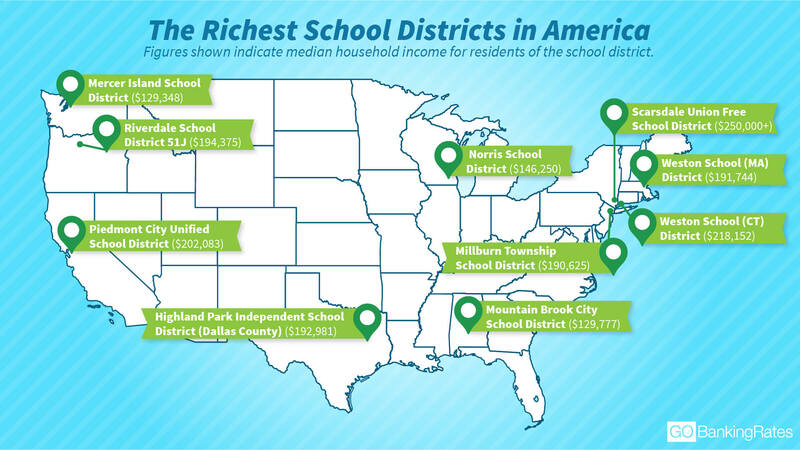 9 in this study with the median income in Mountain Brook School District reaching almost $130,000. In Alabama, the median household income is under $45,000 and a mid-level house costing just $125,000. The flip side of that coin would be the island paradise of Hawaii. The richest school district in the Aloha State is the Hawaii Department of Education, which covers the entire state. Hawaii’s median household income of $71,977 makes it the fourth-wealthiest state by that metric. But when comparing the entire state to the wealthiest individual school district in other states, Hawaii drops to the sixth-lowest median income in its “wealthiest” school district. What’s more, Hawaii’s median home price of $718,400 is the highest in the country. So, it’s a little surprising Hawaii ranks so low in terms of its school district. Here are all the wealthiest school districts in each state in the country. Click through to see best and worst states for families to live a richer life. Methodology: The study analyzed every unified school district in all 50 states, determining the wealthiest school districts based on the highest median household income, sourced from the Census Bureau’s 2016 American Community Survey. Find out which states have a bigger pay gap problem.